Eight bathers gather for their group photo at a beach in Tokaj, Hungary. The historical town is located in the northern part of Hungary. It is in the district where Tokaji wine is produced. The beach goers are wearing bathing suits. Half of the subjects are sitting in a beached rowboat.The reverse of this vintage real photo postcard indicates that the message was written in 1927. It appears that seven of the individuals in the photo are identified in the column on the right side of the back of the postcard. Perhaps a visitor to the cabinet card gallery will be able to leave a comment translating the postcard’s message. This photo postcard is in very good condition. An older Jewish couple are featured in this vintage real photo postcard. An ink caption on the bottom front of the postcard states “Debreczen, Hungary, October, 1927).The couple are well dressed. The woman is wearing a double chained locket and the man is wearing a shirt with a wing tipped collar, a tie, and a yarmulke (kippah). A yarmulke is a jewish traditional head covering worn by most Jews in synagogue and worn by Orthodox Jews all the time. The photographer of this photo is Liener Bela, who operated a studio in Debreczen, the second largest city in Hungary (Budapest is the largest city). One can only hope that this Jewish couple left Europe before the Holocaust. In the first few decades of the 1900’s, Jews made up 5% of the Hungarian population. They had managed to achieve great commercial and professional success. In fact, their success was disproportionate to their numbers in the general population. Their accomplishments fostered resentment and the 1920’s were stained with much anti-semitism in Hungary. By 1920, Jewish enrollment in Hungarian universities were restricted by a quota. Admiral Horthy, the Regent of Hungary, was a self-proclaimed “anti-Semite”. Repressive anti Jewish policies were adapted and fascist groups flourished. Hopefully, this lovely couple survived. This vintage postcard is in very good condition (see scans). This cabinet card provides a portrait of a handsome uniformed Austro-Hungarian soldier. He is posing at the Rudolf Denk studio in Vienna, Austria. Note his high boots, sabre, and wrist watch. The soldier is wearing a couple of medals on his chest. His cap is on the table beside him. He is wearing a whistle which can be seen between his two breast pockets. The soldier is holding an open book. It is likely that this young man saw military action. World War I was not many years away from the time that he sat for this photograph. A pretty woman wearing a fancy dress peeks through a window in a European photography studio. It is unclear whether the studio was located in Hungary or Romania. The photographer of this image is Fiverek Dunky. The reverse of the cabinet card advertises that the photographer won photography medals from exhibitions in London and Paris. 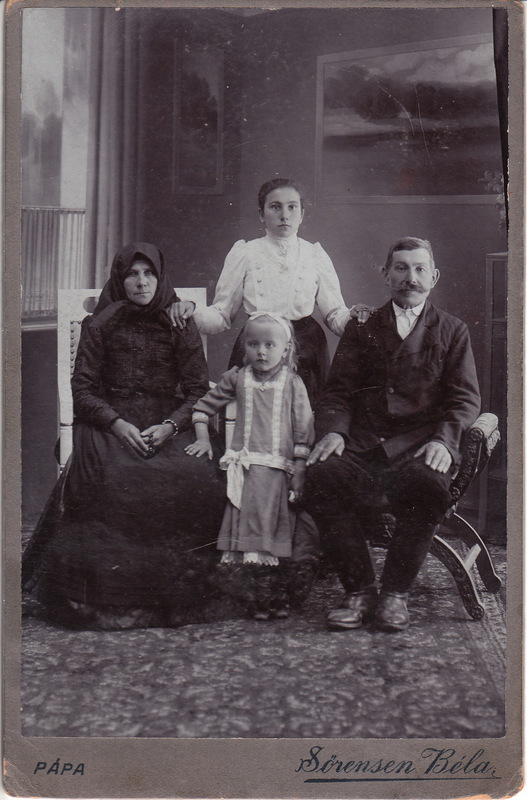 This family portrait cabinet card was photographed by Sorensen Bela in the city of Papa, Hungary. Due to the age of the seated man and woman, it is difficult to determine the family constellation. Is this a photograph of parents with two daughters? Perhaps its a photograph of a set of parents, their daughter, and their granddaughter? The community of Papa is a historical town in northeast Hungary. The town is noted for its baroque architecture and for being the center of the reformed faith in Transdanubia. In addition, Papa was the third to largest Jewish community in 19th century Hungary. 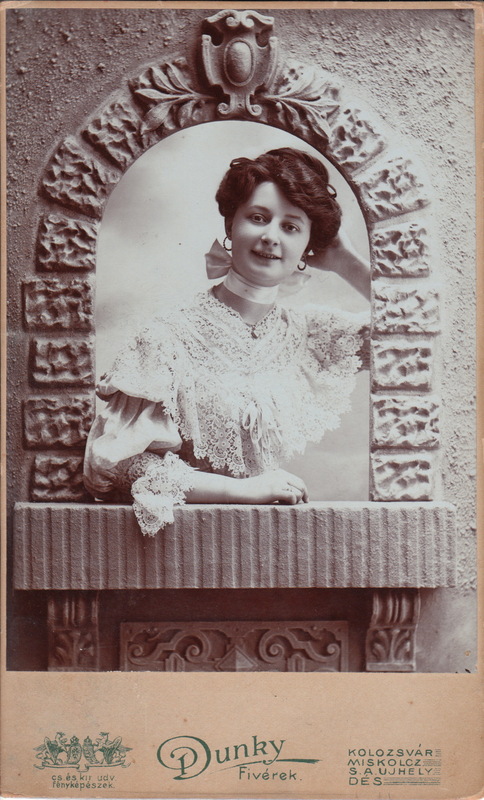 This Cabinet Card captures the image of a Serbian woman in Ujivdek, Hungary. The town of Ujvidek is on the banks of the Danube and is the religious center of Serbians in Hungary. The town is now known as Novi Sad. The photographer is Stojkovits Ivan. The woman is this photograph looks intensely serious as she poses for this photograph. Please leave comments providing additional information concerning this photograph or the history of Serbians during the turn of the century in this area of the world.